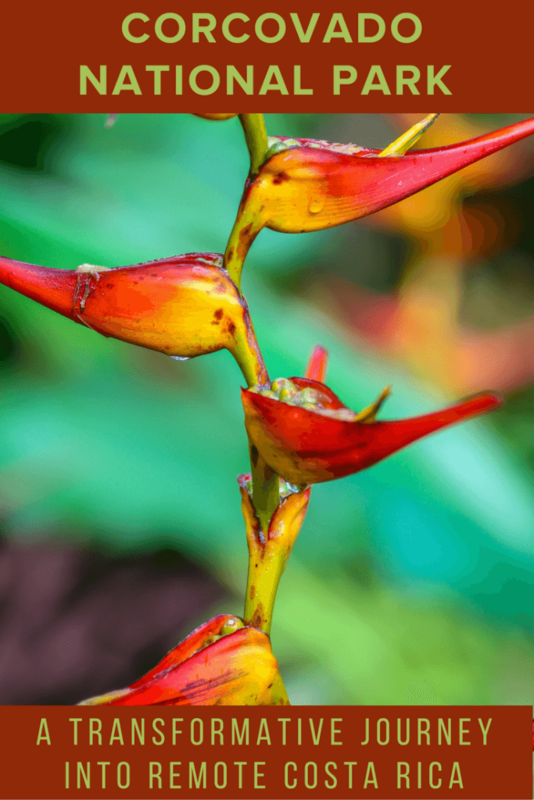 There’s a change that washes over me every time we venture away from the city and into the remote wilderness of a place like Corcovado National Park. 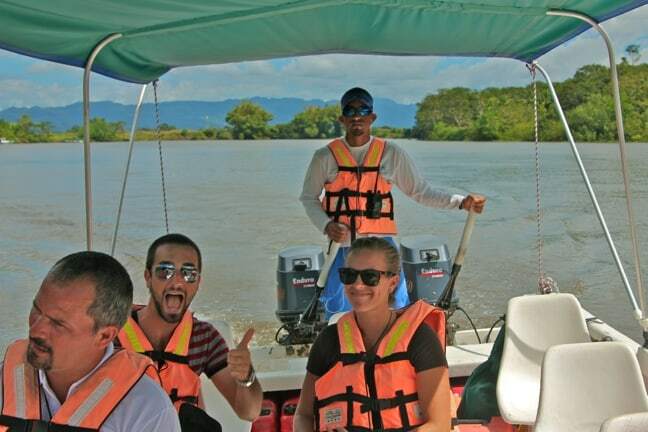 It’s a feeling I’ve gotten every single time we’ve explored ecotourism in Costa Rica. It’s a mental, emotional, spiritual and physiological transformation, like taking the myriad pieces of the puzzle of my soul– which often feels discombobulated and disconnected by the daily complexities of “civilization”– and reassembling them into a perfectly congruous whole. My senses come alive; my eyes, heart, and mind are wide open; my spirit is filled with an almost childlike awe and wonder. It is in moments like these that I feel most like the man I was always meant to be, the NATURAL me, perfectly in tune with myself and the world around me. As our Nature Air flight heads southeast of San Jose towards the tiny town of Palmar Sur (located near the banks of Rio Térraba in the Osa region of Puntarenas), I can feel the stress being shrugged from my shoulders. It’s as if I were shedding filthy work clothes and taking a hot shower at the end of a long day. We pass over impossibly remote mountain villages, winding rivers and, finally, the Pacific Ocean, and all thoughts of deadlines and other responsibilities begin to fade from my mind. 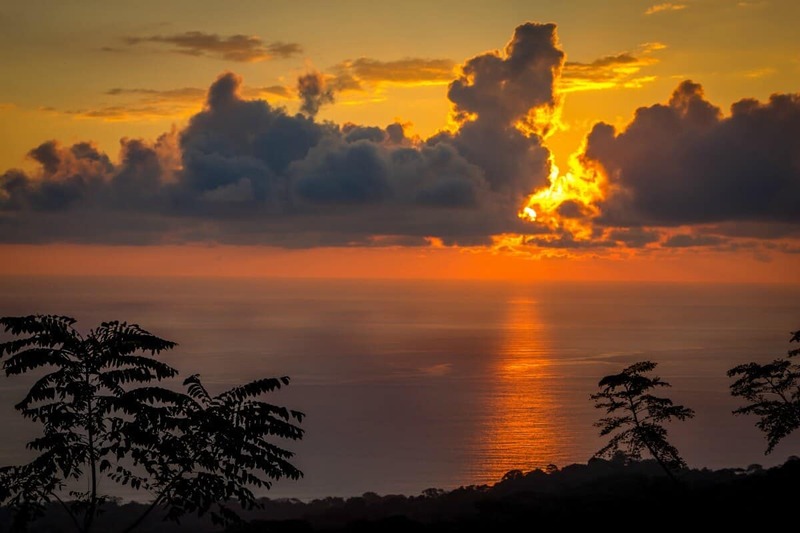 My breathing slows, my body relaxes, and I begin to notice all the beautiful details– cotton-fluff clouds caressing a verdant hillside, the vibrant hues of water where the river meets the sea, the impeccable symmetry of an oceanside palm plantation. As we put our gear into waterproof bags for the 2-hour boat journey to the lodge, that familiar Costa Rica climate kicks in, with the heat, humidity, and dazzling play of sunlight on the water of the Sierpe River combining their powers to create a pleasant, fuzzy-brained feeling I can only compare to a fever dream. 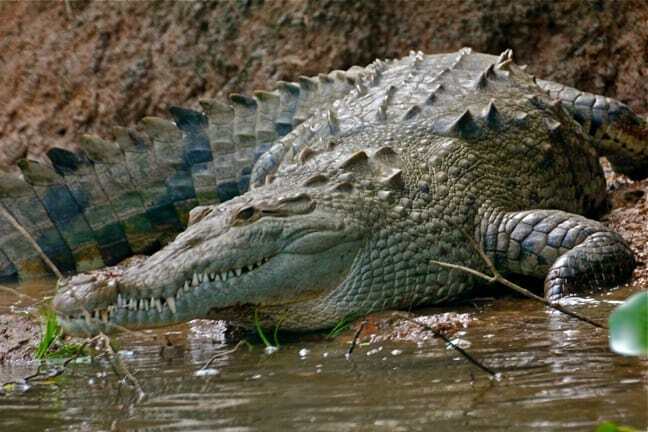 We’re less than 2 minutes into our journey to Corcovado National Park when “Eagle Eye” spots our first Costa Rican wildlife– a gargantuan American Crocodile (which average 12-16 feet in length) sunning himself on the muddy river bank just a few hundred yards from the dock. He holds his ground as the captain slowly navigates the boat closer to shore, providing exceptional views of his exceptionally sharp teeth and prehistoric-looking form. After posing perfectly while Dan and I snap shutters frantically in an effort to capture his fearsome presence, he slips into the river’s murky waters, eyeing us suspiciously. 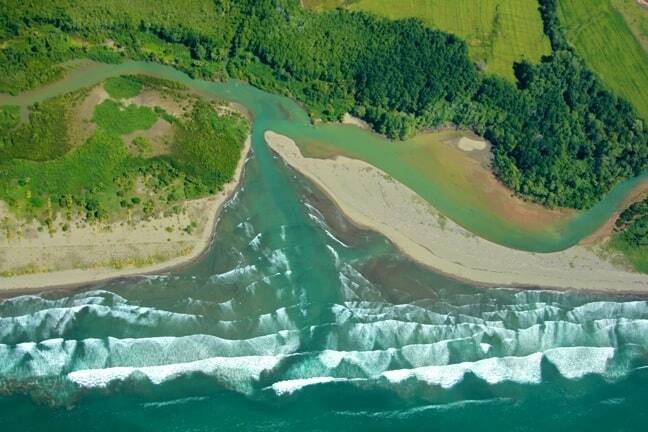 This river was considered sacred by Costa Rica’s indigenous natives, who named it Sierpe (Spanish for “snake”) for the way it winds its coils through the Térraba River, creating a massive mangrove estuary now conserved as the 66,850-acre Térraba-Sierpe National Wetlands. Local legend holds that shaman apprentices, during their last week of training, were required to go on a vision quest. After climbing 7 cascades up a mountain to collect fungus they’d use to make a hallucinogenic tea, they’d spend 7 days drinking and fasting, spending one night at each of the 7 different river mouths (the heads of the snake). Spending time in each of these different locations was believed to impart different fields of knowledge, from astronomy and other sciences to spirituality and medicine. Only after going through this ancient rite of passage could a man become a shaman. 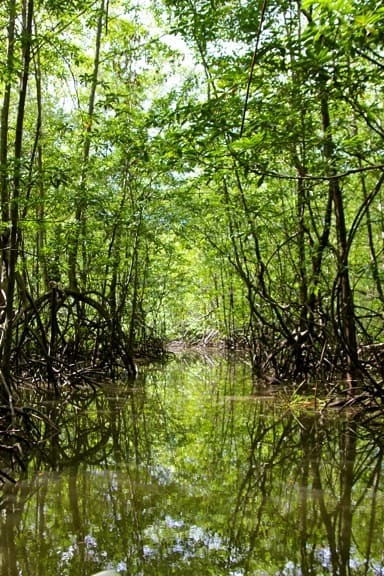 As we venture off the broad expanse of the main river and back into the mangrove estuary, it’s easy to see why the native peoples believed this enchanting area to have magical, mystical properties. The forest canopy glows a brilliant green, with the gnarled tangles of roots creating stunning reflections on the mirror-like surface of the water. There’s a quiet stillness here, and a subtle feeling of being watched by things unseen. Tucked away from the blinding glare of the midday sun, the narrow channels prove to be teeming with wildlife. “Eagle Eye” more than earns his nickname by spotting a veritable cornucopia of endemic Costa Rican species, many of which are tucked so far back into the sanctuary of the woods that it takes several moments to spot them, even through my 500 mm lens. A napping Potoo (nocturnal insectivores related to Nightjars and Frogmouths) is so imperceptible, it might as well be The Predator, with camouflage allowing it to blend perfectly into the branch upon which it currently sleeps. A young Spectacled Caiman (the much smaller relative of the crocodile) is considerably closer, lurking hidden from view under the grass along the shore less than five feet from our boat. 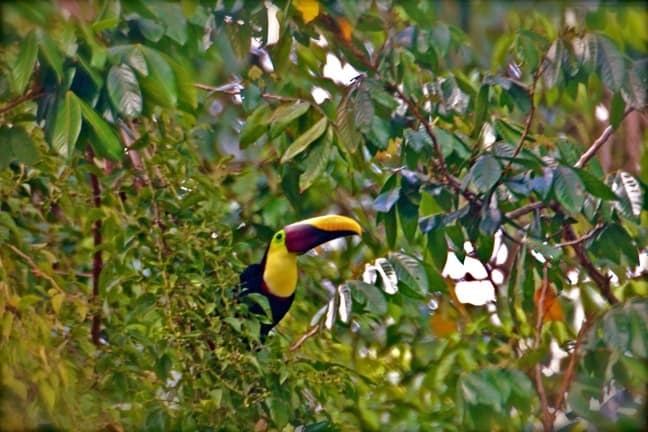 A flock of 5-6 Chesnut-Mandibled Toucans peers down from the trees, wary of our every shutter click. And a family of Spider Monkeys leaps like daredevils through the treetops, utterly oblivious to our presence. Not all of the animals prove quite so reclusive. 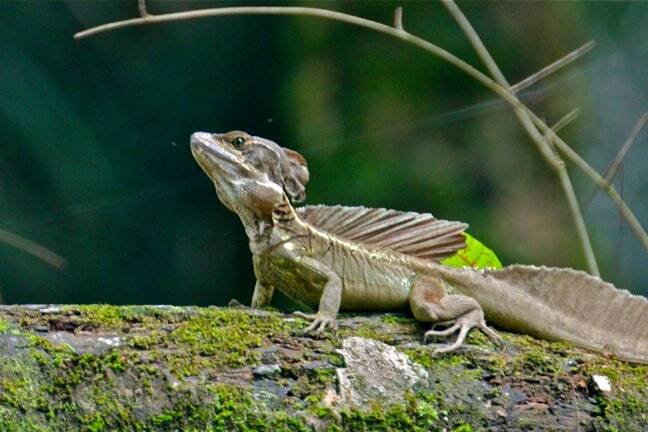 A Basilisk (commonly known as the Jesus Christ Lizard for its ability to run on water) suns himself on a log at eye level right by the river. 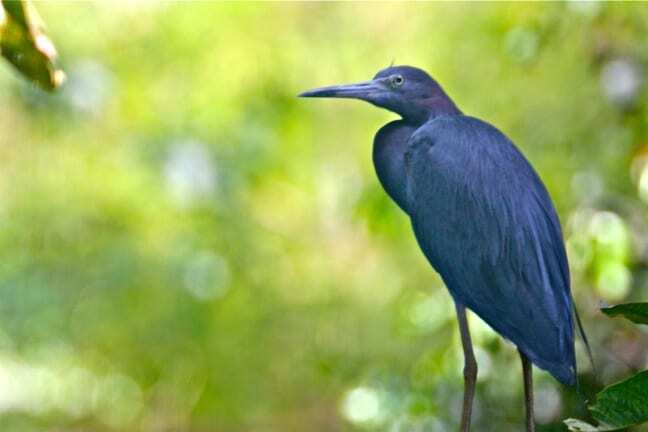 A Little Blue Heron perches on a branch directly above the water, watching for easy prey. And a troop of White-Headed Capuchins skitters busily in the trees along the riverbank, testing our patience (and photography skills) as they hop busily in and out of view in their quest for fruit. We leave the dim light of the mangroves, emerge back onto the broad main river, and make our way through increasingly choppy waters that make it clear the ocean is near. Yet still the wildlife welcome wagon continues to impress. Osprey, Magnificent Frigatebirds, and Brown Boobies soar overhead and alongside us, and a small pod of Pantropical Spotted Dolphins frolics playfully in front of our boat, like giddy horses leading us to some grand fete. 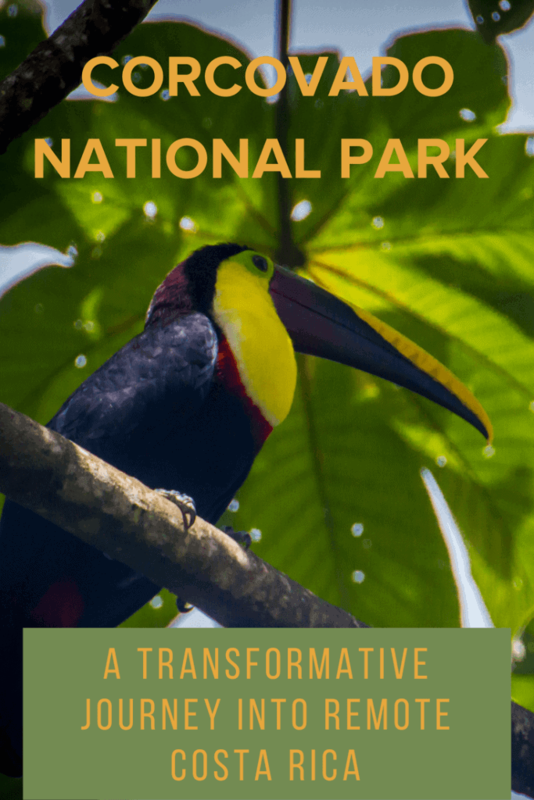 Eventually we disembark with a wet landing on the rocky beach at Casa Corcovado, a Rainforest Alliance-verified sustainable eco-lodge located right on the fringe of Corcovado National Park. By this time, my transformation from bleary-eyed workaholic to wonder-filled nature-lover is finally complete. 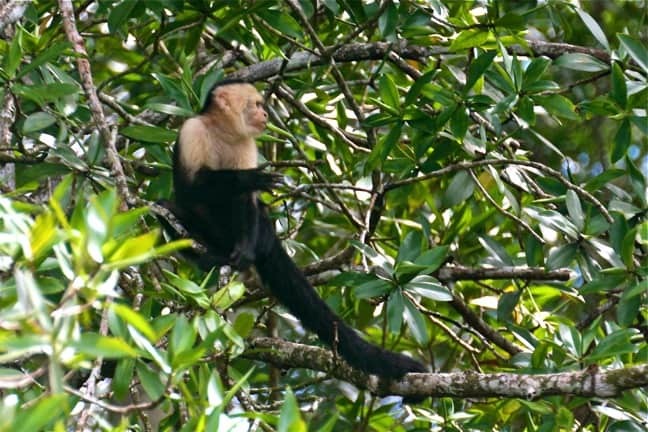 Though the Capuchins romping on the shore elude my lens and the skies suddenly open up with the sort of intense tropical deluge you rarely experience outside the rainforest, my spirit feels lighter, more carefree than it has in months.